Venison is the meat of deer. It is an extremely lean wild game protein. Deer are foraging herbivores with a clean plant based diet. They will graze on grasses, twigs, fruits, and nuts. Basically, their fat and protein intake appears to be mostly from the nuts they can find on the ground. Venison meat in the US is mostly harvested from deer that are hunted. We have seasonal hunting intended to help with the overpopulation of these wild animals, generally in the fall. In other countries, such as Finland, reindeer are raised on farms as a diet staple. We do have a few of these as well. It is not common to find venison in a supermarket. 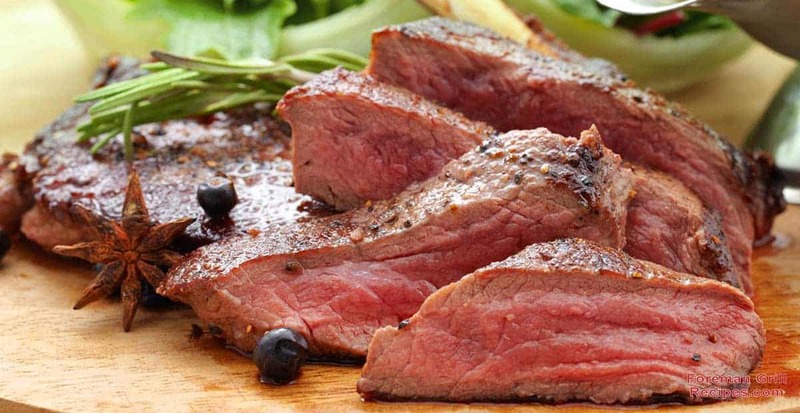 Unless you are a hunter or have a friend who hunts deer and shares the rewards, you will have to order venison from a specialty butcher or ranch. There are online resources. Because of the inherent leanness of the meat, venison can become tough and dry if not cooked mindfully. You can braise the meat low and slow to tenderize it. Or, you can grill or pan sear it for just a few minutes. The timing depends on the thickness of the cut. Venison is fine to serve medium rare. Cooking venison on a George Foreman Grill is a great way to quickly sear the meat. You will need to add some fat or marinate the meat prior to grilling, as outlined in the following two recipes. Venison lends itself well to being served with seasonal vegetables and fruits. Winter squash, sturdy dark greens, mushrooms and cranberries. Below you’ll find two venison recipes, grilled venison with mushroom wine sauce and teriyaki grilled venison medallions. I encourage you to try both. They are both delicious. At the bottom I included a recipe for acorn squash mash. It’s a great side dish for venison steaks. 1. Slice the tenderloin, if not already done. Place the medallions on a plate and coat all over with EVOO, salt, and pepper. Allow the steaks to sit for approximately 30 minutes. 2. Prepare your sauce while the venison sits. In a saucepan, heat the butter and oil over medium-high heat. Add the shallots, herbs, and mushrooms. Cook until the mushrooms are just wilted. Add the wine and reduce by half. Add the stock and reduce again by half. Stir in the mustard for about 30 seconds. Season the sauce with salt and pepper. Turn the burner to low just to keep the sauce warm. 3. Preheat your Foreman Grill to high. Place the venison on the hot grill plate and close the top. Grill for 1 minute. Turn the meat over and grill for another 30 to 60 seconds, depending on how rare you like it. Be careful not to overcook the meat. Remove the cooked venison to a cutting board and allow it to rest a few minutes before slicing. 4. Slice the venison and serve with mushroom sauce over the top. This is good with a vegetable mash, such as winter squash or cauliflower, and some sautéed or grilled greens. A recipe for Acorn squash mash follows the venison recipes. 1. In a bowl, whisk together all of the marinade ingredients. Place your venison medallions in a sealable plastic bag. Pour the marinade in and coat the meat entirely. Refrigerate for 2 to 4 hours. 2. Remove the bag of medallions from the refrigerator 30 minutes before grilling. 3. Preheat your George Foreman Grill to high. Coat the top and bottom plates with the EVOO. Place the venison on the hot grill and close the lid. (Discard to excess marinade). Grill for 1 to 3 minutes for medium rare. Remove the steaks to a cutting board and allow to rest. 4. Serve the whole medallions over acorn squash mash with a side of grilled greens or grilled zucchini rounds. 1. Preheat the oven to 350°F. Cut the squash in half. Scoop out all of the seeds. Place the halves, flesh side up, in a large skillet that can go in the oven. Coat the flesh completely with EVOO, salt, and pepper. Bake until the flesh is soft, approximately 70 minutes. 2. Remove the skillet from the oven. (Remember to use a pot holder). Place the squash halves on a cutting board. Place the skillet on the stove. Add the butter and liquid to the pan to melt. Scoop the squash out of the outer skin into the pan. Mash with a potato masher until combined with the butter and liquid and smooth. Season the mash with salt and pepper.